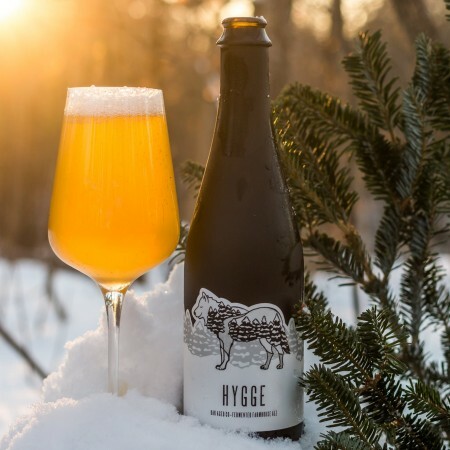 GRAVENHURST, ON – Sawdust City Brewing has announced the release of this year’s edition of Hygge, an annual holiday beer named after the Danish word for “a mood of coziness and comfortable conviviality with feelings of wellness and contentment“. This year, our ‘Fever Dream’ team Caleb & James added Riesling juice from the Malivoire winery to our pale ale wort and fermented it with a blend of our house ale yeast and brettanomyces. Next, oak spirals were added, making for an extremely pale ale, with aromas of light oak and white wine. This effervescent ale has a dry finish with a slight tartness, and is a great accompaniment to food or on it’s own as an aperitif. Hygge is available now in 500 ml bottles at the Sawdust City retail shop and online store while supplies last.